Decalcomania, from the French décalcomanie, is a decorative technique by which engravings and prints may be transferred to pottery or other materials. It was invented in England about 1750 and imported into the United States at least as early as 1865. Its invention has been attributed to Simon François Ravenet, an engraver from France who later moved to England and perfected the process he called “decalquer” (which means to copy by tracing). The first known use of the French term décalcomanie, in Mary Elizabeth Braddon’s Eleanor’s Victory (1863), was soon followed by the English decalcomania in an 1865 trade show catalog (The Tenth Exhibition of the Massachusetts Charitable Mechanic Association); it was popularized during the ceramic transfer craze of the mid-1870s. Today the shortened version is “Decal”. 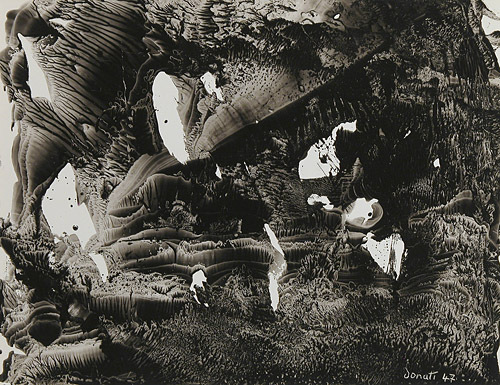 The surrealist Oscar Domínguez (referring to his work as “decalcomania with no preconceived object”) took up the technique in 1936, using gouache spread thinly on a sheet of paper or other surface (glass has been used), which is then pressed onto another surface such as a canvas. Black gouache was originally used in Dominguez’s practice, though colours later made their appearance. Max Ernst also practiced decalcomania, as did Hans Bellmer and Remedios Varo. I am an American artist who has been practicing Decalcomania since 2003. I am excited to have stumbled upon this site and am appreciative for the information above about the origins of Decalcomania. My students and I are preparing for a show at Bowdoin College in Brunswick, Maine in October of 2012. The above information will be very helpful in developing the narrative to accompany our exhibit. I wrote my thesis on “The Art of Fractals for the Mathematically Challenged” in 2010. A portion of the paper was dedicated to decalcomania. When I defended my thesis my professors felt that if I were to pursue my art I should focus on decalcomania. That is exactly what I have done. I am experimenting with techniques to expand the patterns and textures of decalcomania. I also am glad to find others who have a passion for decalcomania. why not check out the English Poet, Charles Tomlinson’s, amazing decalcomanias? Worth hunting out. he had a spell of visual creative activity in the 1970’s and assembled what he once told me was “an Aladdin’s cave” of artwork. His decalcomania was paper/water/black guache based, and the works he produced were quite small – A4 or smaller, I think. an amazing artist. The above text is verbatim on the Wikipedia page for decalcomania. Can’t help wondering who plagiarized whom!